The AIRAID 251-253 fits some Cadillac CTS-V models. See vehicle applications for details. Bought the Airaid intake to replace another aftermarket unit I had previously installed on my CTS-V. 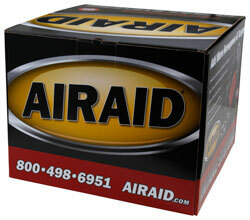 The Airaid unit was easier to install, looked 100 better, and out performed the other guys intake. When you open the hood, the Airaid cold air system looks like it belongs there and in truth, should have been factory installed. I am very pleased with this item. It was a little harder getting the air tube to go on the filter and throttle body even with the clamps extended to their max opening. Other than that it was a breeze to install. The increased HP was very noticeable and I love the sound of the supercharger wine during medium to hard acceleration. I know you don't buy a car like this and worry about gas millage, but on a 562 mile trip I got an average of 20.6 mpg. I know this increase in mpg was due to the new Airaid Intake System. I highly recommend this Airaid Intake System mod. The engine breathes a lot better.